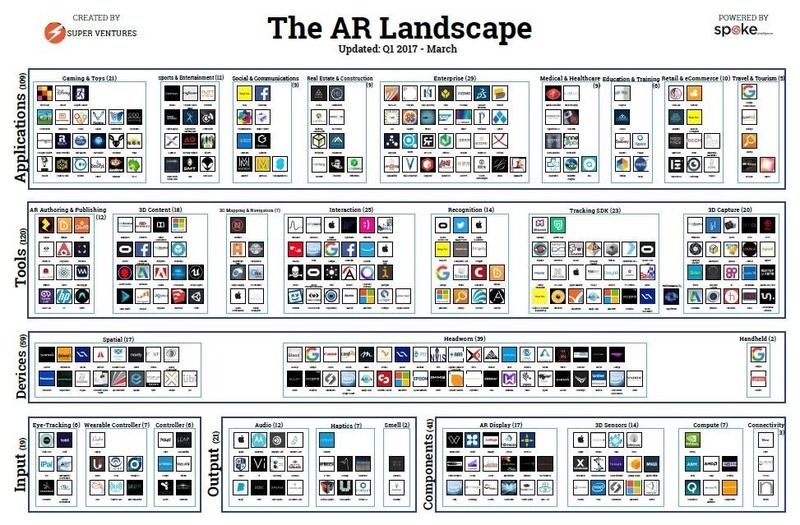 Super Ventures has published "The AR Landscape," a chart encompassing the major players and startups that are shaping augmented reality. Launched in February as the first incubator and fund focused on augmented reality, Super Ventures outlines companies working augmented reality applications, tools, devices, input/output methods, and components. The AR Landscape lists 312 companies, representing $12.1 billion in funding and $69.6 billion valuation. It runs the gamut from startups and innovators to tech giants and industry leaders, listing names such as Magic Leap, Occipital, Blippar, Niantic, Google, Apple, Microsoft, Intel, Disney, and more. The high-resolution version of the chart can be downloaded here.